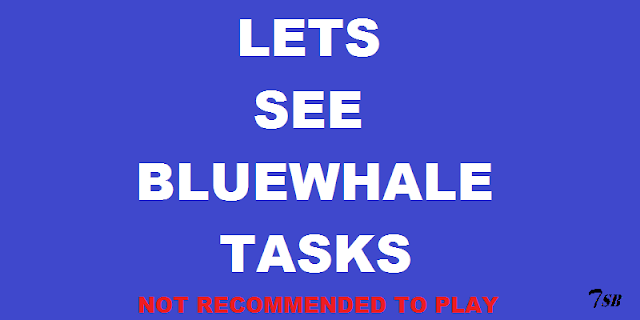 Home / Bluewhale / Bluewhale Tasks : Whats inside Bluewhale? The game has 50 tasks. You will be asked to do one by one as soon as you start playing the game. These taskS are so scary that people commits suicide. The way the tasks starts that makes their mind ready for the 50th task. The list of tasks which people see are shared below. 1. Carve with a razor "f57" on your hand, send a photo to the curator. 5. If you are ready to "become a whale", carve "YES" on your leg. If not, cut yourself many times (punish yourself). 7. Carve "f40" on your hand, send a photo to curator. 8. Type "#i_am_whale" in your VKontakte status. 13. Listen to music that "they" (curators) send you. 21. Have a talk "with a whale" (with another player like you or with a curator) in Skype. 25. Have a meeting with a "whale." 28. Don't talk to anyone all day. 29. Make a vow that "you're a whale." 30 to 49. Everyday you wake up at 4:20am, watch horror videos, listen to music that "they" send you, make 1 cut on your body per day, talk "to a whale."